I did an interview in September of 2008 for Roger Pierce of BizLaunch for the Toronto Sun's career section on new entrepreneurs. The idea was that, since I deal in spooky stuff, the newspaper would run the article during October to tie into the whole Halloween vibe. However, the Sun's editors kept bumping the article in favour of stories about single-moms and daycare services. Yawn. Real spooky-like. But enough bitching and moaning. The article is currently available on-line - but I'm not sure for how long. So click to it ASAP before they change the link to something about a dog walking service for the left-handed. If you've ever considered starting a small business be sure to check out BizLaunch. They provide loads of free information, seminars, links, etc. for anyone seriously considering the entrepreneurial life. We have a winner for our December DVD giveaway contest through www.DeadHarvey.com. The lucky stiff is Judson Scott of Los Angeles, Karloffornia! Congratulations Judson! As I type this our trusty international letter carriers are relaying their way across the continent to deliver Judson's prize in a timely manner. Dim the lights & enjoy! If you missed out on the December contest, fear not. Check out our January contest at www.ObscureHorror.com. This contest's prize draw happens on Monday February 2. So enter soon. Just send your answer to the skill testing question to "contest@aaaaah-films.com" and be sure to put 'OBSCURE' in your e-mail's subject line so the web-monster doesn't pitch it into the junk mail pile. We are proud as hell that one of our own filmmakers, Anthony Falcon, has just released his debut feature-length film, "99 Pieces". It seems like only yesterday we saw little Anthony's short film, "The Ninth Entry", on volume 1 of AAAAAH!! Indie Horror Hits. And now he's grown up and gone all Orson Welles on a feature film. He's the writer, producer, director, actor... Such a talented boy. Brings a tear to my bloodshot eye. Bonus short film: "Quin's Run"
Visit the 99 Pieces page on MySpace for details on how to get your grubbies on a copy. We're barely into the new year and already looking ahead to St. Valentine's Day. Yes, that special day when you get to curl up with your favourite other and think monstrous thoughts. But what to do on that magical evening to get in the mood? Well, for horror lovers this year it's easy. You can turn down the lights, get close and watch a free copy of AAAAAH!! Indie Horror Hits, Volume 1, thanks to the fearsome folks at ObscureHorror.com. They've got more reviews on obscure and hard to find horror films than you can shake a stick insect at. For your chance to win the free DVD visit their contest page. You'll find the answer to the skill testing question in plain site within the interview with yours cruelly. Then send an e-mail with the answer to contest@aaaaah-films.com. Be sure to include the word 'OBSCURE' in the subject line so the web-monster knows no to trash your response. Enjoy the interview & the horror reviews - and beast of luck. 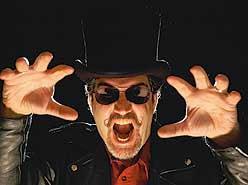 The Madison mad-caps Freakshow and the Harlots of Horror are at it again, with wild revels in the middle of January. Don't they know how freaking cold it gets in January in the Mid-West? If you're in the frigid vicinity, the Bordello of Horror launch party will take place at The Annex in Madison, Wisconsin on Friday January 23rd @ 8 PM CST. 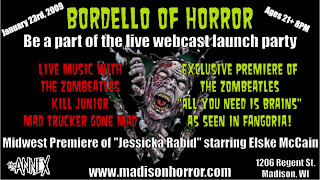 If you can't be there - or don't want to brave the sub-zero - you can catch it from the comfort of your internet console via live broadcast on the Bordello of Horror Video Channel. The live/dead webcast will feature the world premiere of the new mocumentary "The Zombeatles: All You Need Is Brains". I wonder if Yoko Oh-NO will make a guest appearance? There's also live music and the Mid-West premiere of "Jessica Rabid", starring Elske McCain. Good time? Sounds like a starving zombie (no-brainer) to me. You can get more details at the Madison Horror Film Festival's web site. Still got the sugar jitters & nausea from too many holiday sweets? Good news. The official GoreZone on-line Forum is up and running and is THE place to spill your guts on all things horror! Remember to contribute responsibly. Don't drink and post.